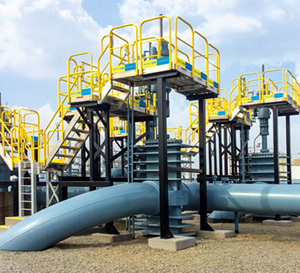 In the past, crossover or work platform your options were limited to standardized manufactured welded steel products or to custom design and fabrication. These solutions are economical and they work well for a single purpose. But what if your production plan or plant layout had to change? What if you need to relocate entire sections of your facility, or have needs that shift frequently? Then, it’s back to square one: you have to redesign, purchase, and wait for a welded product to be implemented. Your old hardware may have to be scrapped. Welded crossovers and structures are ideal for long term installations, but lack flexibility. You can move an existing platform, if the new application is identical or substantially similar to the previous one. But it can be time consuming and difficult. 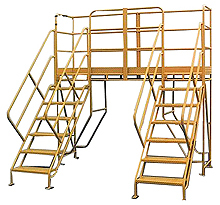 Welded steel construction held you to one set of specifications for where the crossover or work platform could be useful. Industrial engineering today is more focused on usability over the long term with the understanding that industry is an ever-changing entity that requires flexibility in design elements. Because of this demand, many product designs have shifted to modular components for added versatility in how the product is placed and used. With crossovers and work platforms, this idea led to the creation of a modular system that consists of platform modules, stairs, ladders and supports. 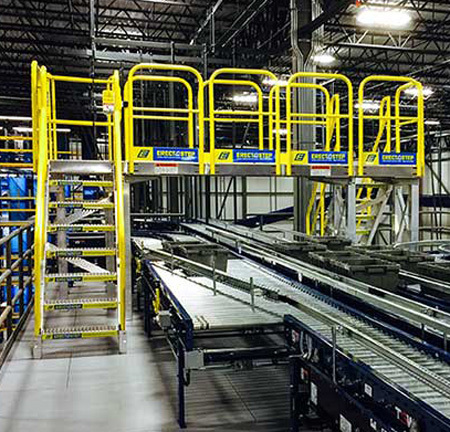 With those components, you have the flexibility to change the crossover or work platform configuration either by unbolting and re-arranging the components, by adding more components, or replacing some of the components to create a new crossover or work platform that fits your new needs. The beauty of modular design is that you never return to square-one with an empty basket, so to speak. 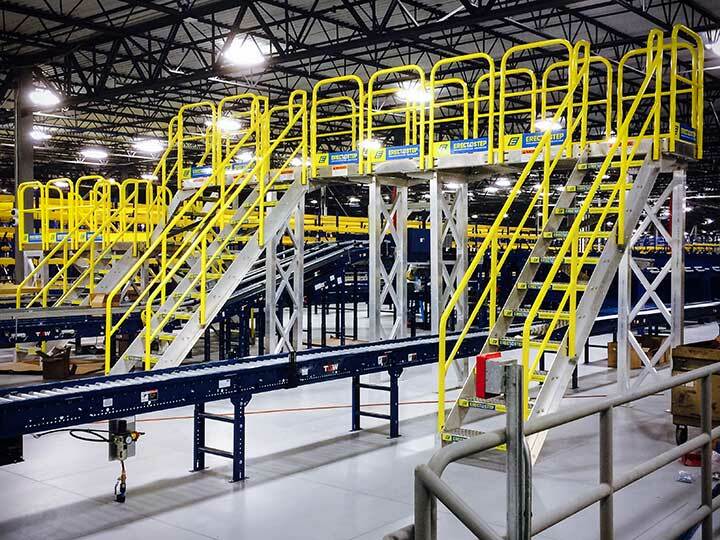 With ErectAStep (a standardized modular crossover and work platform system) and PerfectAStep (a custom modular system) you deal with 5 basic components (platforms, stairs, ladders, support towers, and handrails) to create the crossover or work platform you need. 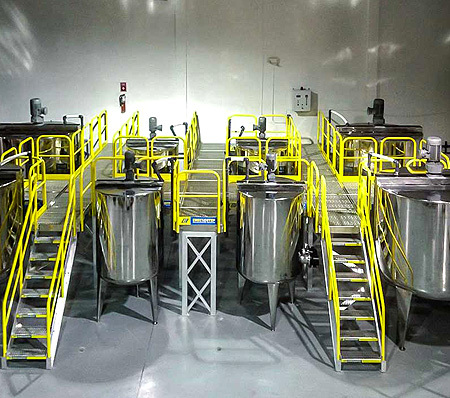 By adding the various components together in differing quantities, you can make anything from a simple 2-step high crossover with a 36-inch wide clear span that’s 12 inches high to a massive access platform system involving 100 stair units, 50 tower supports and 50 platform modules with handrails for fall protection that provides access to an entire production floor of machinery and equipment – and if your facility needs change, your crossover or work platforms can change, too! That’s the beauty of the modular idea – when your business plan changes, your crossover and work platforms can be re-configured to match those new needs. Simply unbolt and re-arrange the pieces. You may need to add or subtract some modules, but you’ll always be able to re-use the various components. Yes: welded and custom fabricated platforms and work structures are less expensive. Nobody is denying that. However, modular systems are precisely engineered and machined. The parts fit the first time, every time and that adds up to installation time savings. 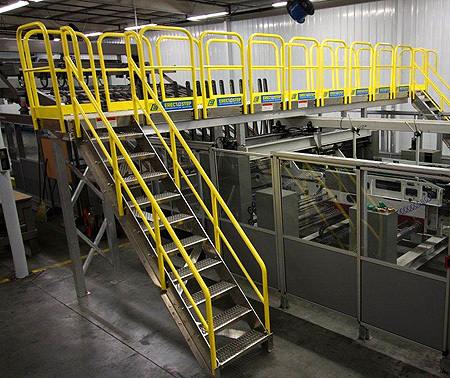 You provide specs for what you need, clearances required and a design configurator creates your crossover or work platform on the spot, allowing you to view, change, and save it. Place your order and in a couple of weeks, you can have the job done. This flexibility helps reduce the overall cost of ownership. It also shrinks lead times by at least half compared to a welded or fabricated solution. Also, since these systems can be broken down and palletized, you don’t have to worry about shipping a fully welded unit. That’s expensive, and can lead to damage in transit. ErectAStep modular systems are lighter and ship for less anyway. They also condense to pallets and can be better protected from shipping damage. The simpler your crossover or work platform needs are, the easier it will be to find a standard sized welded steel unit that fits your budget. As your needs become more complex, it will become advantageous to look into the benefits of modular design and custom-configuration-on-the-fly possibilities. Oh – did I mention these things are made of aluminum? Structurally strong, but easy to assemble, move, and reconfigure. Very light for their high capacities. One more advantage over the weight and bulkiness of the welded steel option.